As seaside piers enjoy their busiest month of the year, we have published a report by Jess Steele, The People’s Piers, which examines the ownership, usage and future of Britain’s piers. o 69% of the UK population have visited a pier within the last 5 years, and 70% want to visit in the future. o Just 3% of people would stay away from a pier despite the fact that 3 in 4 people say that seaside towns are shabby and run down. o In Wales 72% of people want to visit a pier but only 52% do in Scotland, where fewer piers survive. o Far from being a retired person’s pursuit, visiting a pier this summer has been more attractive to people under-35 than to those who are older. Jess is Director of Jericho Road Solutions and an Associate Director for Community Organising for the wonderful national charity Locality. I first met her many years ago when she was trying to save a bridge over Deptford Creek in South London. Our shared friend, Jani Llewellyn, herself an inspiring activist and a passionate co-operator, brought us together, but died of cancer soon after. Jess now lives in Hastings and has been directly involved since 2006 in the community efforts and activism around the rebirth of Hastings Pier. Hastings Pier was rotting away under private foreign ownership (registered in Panama) until it was closed on safety grounds. The pier which was opened on the first ever August Bank Holiday, in 1872, transferred this month to community ownership. Alongside heritage grant funding, a ‘community share’ issue is expected to be launched in September so that local people will own the pier. At present 56% of piers are privately owned, with 39% in local authority hands and 5% in community ownership. A new network of ‘people’s piers’ is emerging with the aim of spreading the community ownership model. Brian Smith, Chief Executive of Britain’s leading leisure co-operative HF Holidays and Chairman designate of the new Britain on Foot campaign, added: “Many of Britain’s piers are in disrepair. The co-operative model offers a new option, working in partnership with the local community to renew and maintain our seaside piers”. We are now campaigning for a fast-track compulsory transfer process to rescue important community and heritage assets and a presumption in favour of local communities taking ownership of such assets. I am not saying that co-operative piers can kick-start the economy, or be anything but hard work for those who care about them. But, look at this photo that I took a few days ago of Hastings Pier, still run-down and now to be refurbished. When they succeed, when they are renewed… they could be exactly the image of hope, co-operation and renewal that the coastal communities of our island nations need. This is a guest blog by Philip Monaghan, CEO of Infrangilis, who has a long track record of work on issues of corporate accountability. It is the job of ratings agencies to make judgements. Recently, one example was when Moody’s joined Standard & Poor in June 2013, announcing a downgrade of the credit rating of the Co-operative Bank. There is no credit or benefit in shooting the messenger, but it is legitimate to ask whether the ratings agencies are effective and balanced in what they do. Are these private firms ‘fit’ to rate businesses, countries, cities or individuals? A rating of raters produced by the research agency Infrangilis last year suggests not. Infrangilis’ study compared and contrasted the performance of rating agencies. Each agency was rated according to their performance with regard to responsible leadership, good governance, public disclosure, and ratings performance. The study concluded that there is a negative outlook for the industry as a whole, in terms of it being fit for purpose. Ratings agencies emerge as comparatively poor across the board, but in particular in relation to aspects of ‘responsible leadership’ and ‘ratings performance’. In terms of responsible leadership, this appears to be because ratings agencies have a narrow understanding about the impact of their actions: they have failed to respond in terms of their accountability for the onset and the depth of the credit crunch, but they also fail to integrate other, non-financial problems too – not least, environmental resource constraints. These findings are supported by the damning verdicts on ratings performance that 6 of the leading 7 ratings agencies have received in annual checks made by both the European (ESMA) and US (SEC) regulators. There can be little assurance for those in the private sector that ratings agencies understand enterprise models that are not shareholder owned. According to respected financial commentators such as Money Week the severity of the downgrade of the Co-operative Bank overlooked the fact that it was part of a bigger mutual (The Co-operative Group) with a diverse balance sheet, values and history of looking beyond short-term profit. The ratings agencies, of course, have a longer track record of getting judgements wrong. If you are in the business of judgement, that may appear to be an occupational hazard. But the real questions are whether those mis-judgements are hardwired into the business model of the ratings agencies so that it is their own financial incentives and starting assumptions rather than evidence that at times drives what they do. Their failure to warn investors in advance, or if at all, about US sub-prime mortgages, the Lehman Brothers collapse, the Greek default during the 2007/08 banking crisis, or the subsequent Eurozone crisis of the past two years are just recent latest examples. Around the credit crunch, ratings agencies gave AAA ratings to 75% of the $3.2 trillion sub-prime mortgages that subsequently lost sizable valuable just months later. The 1997 Asian financial bubble and the 2001 Enron scandal are other examples of a list of miscalculations that stretches over decades. The flaws of the ratings industry are of concern not just for member-owned enterprises but for the economy more widely. If you exclude environmental risks, you encourage pollution and unsustainable resource extraction. If you ignore unconventional businesses, you add costs to enterprises for little benefit. The campaign for social responsibility across companies has moved forward in a very constructive and practical way in recent decades. A debate on the social responsibility of ratings agencies now needs to follow. I visited the Lincolnshire Co-operative Society this week, to see how they are creating space on the high street for libraries. With cuts all around, the county may have to close up to 32 of its 46 libraries. This is where the co-operative has stepped in, recognising that if communities want it, then there may be new ways to keep the service alive. The co-op is piloting 5 libraries in-store, as well as services such dropping off books with its existing home prescription service for house-bound patients. In Waddington, Lincolnshire, the library had been reduced in recent years to opening two mornings and one afternoon a week. Now, it is ensconced within a Co-operative Pharmacy, open from Monday to Saturday. It operates with an automated book machine, with a drop off hatch outside the shop – plus volunteers that help out. Why does the co-op want to do this? The answer was that it always has. It opened the very first library ever in Lincolnshire in 1876 – spurred on to do so because the signatures on its own founding articles included Xs from the labourers who could see the sense of setting up the business but didn’t have the reading and writing skills to sign their name. I met Chris Donnan behind the pharmacy counter. The library opened on the morning of the day his baby was born, November 30th 2012, with winter snow falling outside. What he appreciates is the bustle of people in and out. Even so, the atmosphere is quiet and considered – and Chris and his colleague are able to focus on prescriptions and advice rather than the shampoos and spot creams that embroider most pharmacies. 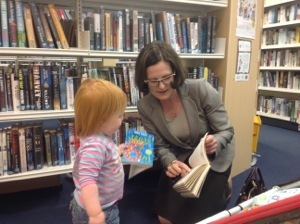 While I look around, Ursula chats to eighteen month old Fleur and her sister, for whom books are a passport to imagination. The shelves are full of well-thumbed books. Wayne Rooney’s unofficial biography is on the table alongside children’s books, fiction and non-fiction for grown-ups. Alongside the pharmacy / library is also a post office outlet, another essential local service in Waddington run by the co-operative. Together, they create a footfall that makes the space viable overall. There is no hard sell, no hidden charges. It is just a new way to meet an old need. The volunteers, like all volunteers perhaps, are a few people who put themselves forward and more who are asked. The co-op has its own volunteer coordinator, Rachel. Until the library opened, her job was about helping co-op staff, working in over seventy outlets across the country, to do volunteering outside of work hours. Knowing how to deal with insurance and to organise cover, she now is the link person for people from the local community who help out on four mornings and one afternoon a week. Waddington is on a country ridge known as the Lincolnshire Cliff, with views out over the River Witham valley. It feels like a place in which you can look forward and look further. A library in a shop? Why ever not.